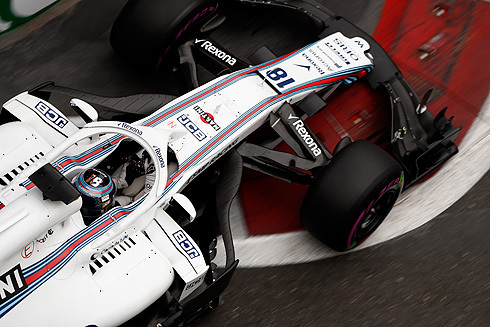 The results of qualifying for the 2018 Azerbaijan GP would see the Williams Martini team come home with their drivers finishing in 11th and 12th. 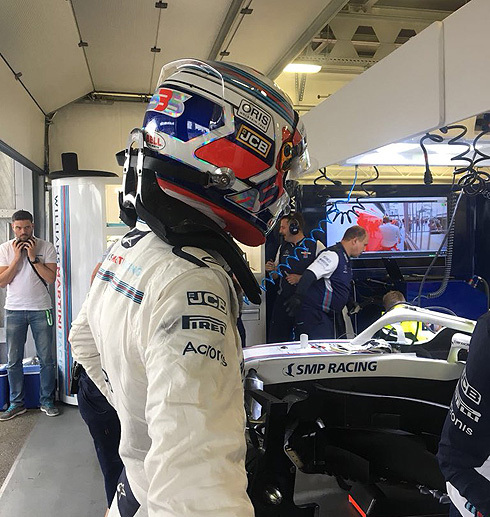 Lance Stroll would finish ahead of team-mate Sergey Sirotkin in what was a step forward for the Williams team after having struggled in qualifying in earlier races. Both drivers would make it into the second period and Lance only missed out by the smallest of margins in not making it into the final period. What with other drivers receiving penalties the pair will start Sunday's race from 10th & 11th. With the start of the eighteen minute first period Hulkenberg would set a 1m:44.694 with Sergey now second. A 1m:43.929 from Ocon seeing the Williams drivers now third and then fifth. Both Williams drivers were out nice and early to help with the lack of running in the final practice session. Ricciardo was now quickest with a 1m:43.259 but Vettel would go quicker with a 1m:43.129. But Raikkonen would move ahead of both with a 1m:42.985. Ocon was now second followed by Vettel, Verstappen, Ricciardo, Hamilton, Bottas, and Magnussen eighth. The Williams drivers were now 11th and 15th with five and a half minutes remaining. Raikkonen would set a 1m:42.538 while Hamilton would move into second, followed by Vettel and Ocon. Verstappen was now second with a 1m:42.642. The two Torro Rosso's would make contact ending their sessions. For Williams the period would end with both cars making it through it Sergey 14th and Lance 15th. So for the first time this season we had Williams cars in the second period of qualifying. Now it was the second fifteen minute period with both Williams cars coming out very early staying on the ultrasoft tyre. But there was a large number of drivers coming out on the supersoft tyre looking to run a different strategy. After the first runs it would be Bottas quickest with a 1m:42.679 running on the supersoft tyre. 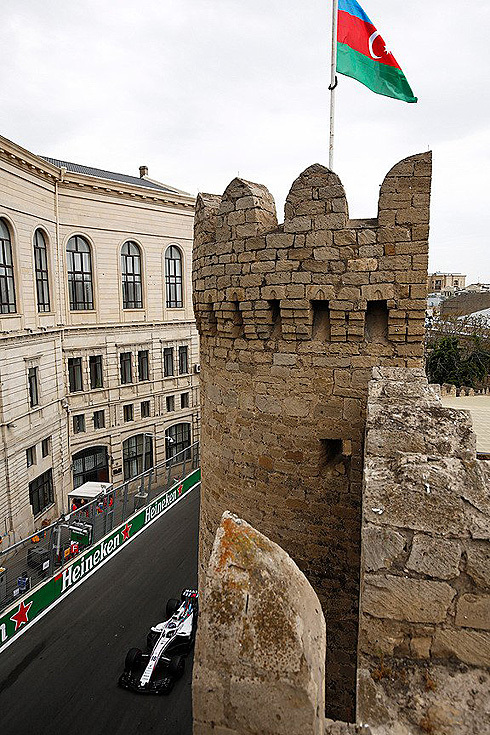 But Hamilton would go quicker with a 1m:42.676. Verstappen was third followed by Vettel, Ocon, Ricciardo, Hulkenberg and Sergey now eighth. With just under five minutes remaining the Williams drivers were currently eighth and 15th. Both Williams drivers were on their second runs and they would see them finish in 11th and 12th. The top ten would be Raikkonen, Hamilton, Bottas, Verstappen, Ocon, Vettel, Hulkenberg, Perez, Sainz, and Ricciardo. Of the top ten the top five would all set their quickest times on the supersoft tyre. The final period would see Vettel quickest after the first runs with Hamilton second followed by Bottas, Verstappen, Ricciardo, Raikkonen, Ocon, Perez, Hulkenberg and Sainz tenth. Vettel had set a 1m:41.498 to be ahead of Hamilton by 0.3. All the top ten drivers would pit returning on new ultrasoft tyres. But Vettel would remain quickest despite the efforts of both Mercedes drivers and Raikkonen. Ricciardo was now fourth followed by Verstappen, Raikkonen, Ocon, Perez, Hulkenberg and Sainz remaining tenth. So it was Vettel taking pole position while for Williams their drivers would finish in 11th and 12th. A great result from the Williams team with both Lance and Sergey having the option to run different tyres for the start of Sunday's race. For Sunday's race Lance and Sergey will start the race from tenth and eleventh as a result of Hulkenberg receiving a five place grid penalty for a gearbox change. Lance would be first out in Q1 running on the ultrasoft tyre. Lance would set a 1m:45.195 to be fourth dropping to fifth. Quickly Lance would drop to 15th and he would pit. Lance would also return for another run on new ultrasoft tyres, currently 17th. Lance was on an improved lap and would set a 1m:44.824 remaining 17th. Lance was able to set an improved time with a 1m:44.359 and move into 15th. Lance was now in the second period and would come out for his first run on new ultrasoft tyres. But Lance would go down an escape road and would decide to pit as a result. But he would quickly return on a new set of ultrasoft tyres for a second run. But for lance his second run would see him set a 1m;43.737 to be seventh. But Lance would drop to tenth then 11th despite having set an improved 1m:43.585. Sergey's car would be repaired for the session with Sergey coming out behind his team-mate, also on the ultrasoft tyre. He would set a 1m:45.138 to move into second. But as others set their times he would drop down to 11th having improved with a 1m:44.261. Sergey would continue to improve with a 1m:44.261. Sergey had used his radio to thank his mechanics. Sergey would also pit after a five lap run. Sergey would return with a new set of ultrasoft tyres, currently 12th. He would drop to 14th as the period came to an end. He would remain in this position making it into the second period. On his first run in the second period Sergey would set a 1m:44.026 to be third dropping to seventh. Sergey would also pit after his first run. He would also come back out for a second run. Sergey would improve in the first two sectors but failed in the third remaining eighth. With his team-mate going faster Sergey would drop to ninth then 12th despite having improved with a 1m:43.886.